❤ 1-Year Blog Anniversary GIVEAWAY! Last week I hit my one year anniversary mark, I can’t believe that it has already been one year since I started this blog. My first year of blogging has been amazing – not only have I learned and grown a lot but I’ve also made some really good “beauty blogger” friends. So to celebrate my one year blog anniversary I’m hosting a giveaway for my lovely readers and the prices are some of my personal favorite makeup products. 2. Leave a comment telling me why you want to win these prices. This giveaway will be open internationally and will end on August 19th. There will be one lucky winner – once I’ve picked the winner I will send the winner an e-mail and do a blog post announcing the giveaway winner. Disclaimer: All the giveaway prices are brand new and purchased by me. I would love to win these as I never tried Sleek ANYTHING! And congrats on one year! First and foremost Congratulations on hitting the 1yr mark, many more glorious blogging years to come, Amen. Congratulations on the one year mark! Many more to come…I would love to win your giveaway so I can give them away to charity. Just kidding! I think the products are hot and would love them as a part of my collection. I just recently lost my father to cancer and have been helping my mother financially so I can’t afford a lot of things anymore. Please pick me but I’m sure whoever you pick will deserve it. Blog on fellow beauty bloggers! Happy Anniversary – I’m sure everyone’s loved reading your blog as much as you’ve loved writing it! I’d like to win because I can’t get sleek or mac in the town I live in and I’ve just missed out on a pair of Jeffrey Campbell Spiked Damsels for an amazing deal so I need cheering up! I would love to win because I’ve never tried Sleek before! Thanks for a great giveaway! Again, congrats and have fun!!! I’d love to win these. Today is my blog’s 1 year anni too, we’re blogiversary twins! Congratulations! Of course I want to win these prizes because I love makeup so much like you!!! 🙂 You will surely have a long way to go! Take Care! I’d love to win because well honestly I’ve never won a thing in my life. Also sleek is not available in Korea or South Africa and I’ve only heard good stuff. I can’t justify buying another red lipstick from Mac as I already have Russian Red, but I’ve always wanted Ruby Woo 🙂 good luck everyone!!! Fabulous giveaway! I’ve never worn false lashes before but I’d love to try it. And thank you for the awesome giveaway!!!! Why do I’d love to win the goodies??? Well, I’ve never tried anything Sleek and I’ve heard their palettes are ah-mazing! Those lashes could be useful for a night out, definitely! And..Ruby Woo..do I even have to say?! It’s on my wish list since AGES!!!!!!! Plus, buying MAC here in Italy is basically off-limits because everything is too expensive! I follow your blog by WordPress, of course! Congratulations on your 1 year blogversary hun!! ❤ I love love love your blog and your makeup looks as you already know! 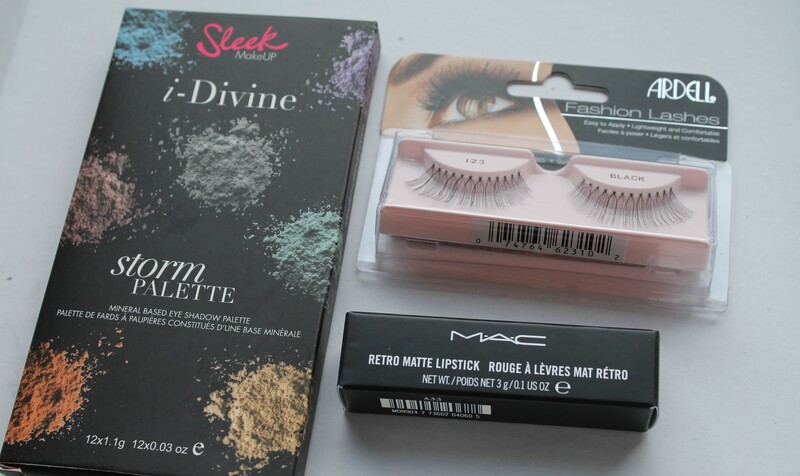 I'd love to be entered into your giveaway – I want to win these pieces because I am a fan of long lashes, I have yet to get my hands on the riri woo lipstick ( that you so highly recommended) and I have been dying to try a sleek palette! Congrats on your 1yr anniversary on your blog!!!!! I just started my blog and I hope to be as good as you are when I’m at my 1 yr. I love your blog. I just recently started following and I love that I get notifications when you blog so I can read up on everything. I would love to win because I’m always looking for new companies to try and review and I have yet to try Sleek or Ardell lashes. I LOOOVEEEE MAC lipstick!! It would be a great prize to win and then do a review on what I get lol. Thanks for doing the giveaway! That’s awesome! Eventually I want to open my own blog and I’d like to experience more brands and products to gain more knowledge. 🙂 I’m dying to try MAC lipsticks! Because it would be my first MAC lipstick, as well as my first red lipstick !